The recent trend in New York City restaurants and bakeries is to offer one thing and (hopefully) do it really well. See Puddin’ on St. Marks. But what if a bakery opens up and kills it in multiple categories? 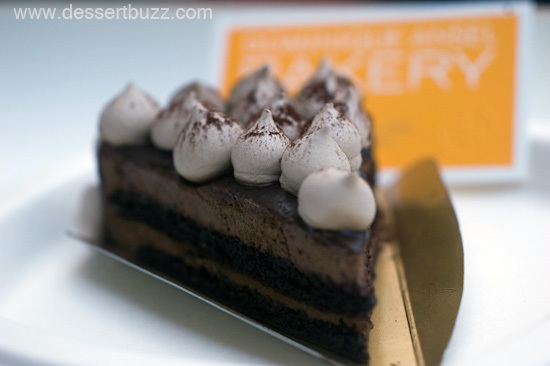 Well, after my third visit I have even more conviction that Dominique Ansel Bakery is the best new bakery in Manhattan in a long time. 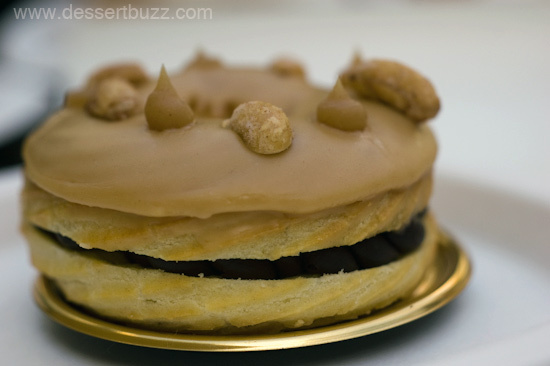 They have a number of best-in-class pastry from the canneles to the kouign amann (dubbed the next big thing by pastry chef and instructor Francisco Migoya) to special eclairs. Let’s take a walk through the sweet side of the menu. 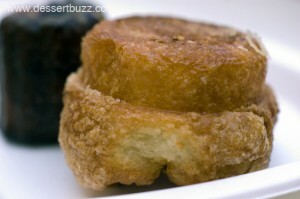 Kouign Amann: Confession time for the editor. I had never heard of a “kouign amann” before September when Ansel and some other high-credibility chefs started talking about them at his bakery. I’ve now eaten two or three so I consider myself an expert (I kid!) You don’t need 17 years of pasty experience to know when you taste something special. Here’s a video of Ansel in action creating the pastry. The best description of what a Kouign Amann is can be found on David Lebovitz’s blog. Why order it? Because it’s like a great croissant with a “perfectly-caramelized melange of butter, sugar, and salt” and in the words of David Byrne nothing is better than that. Black and White Eclair: Dominique Ansel in not from New York but he shows he has learned a bit about what New Yorkers’ like by offering a classic French pastry that evokes the iconic NYC black and white cookie. 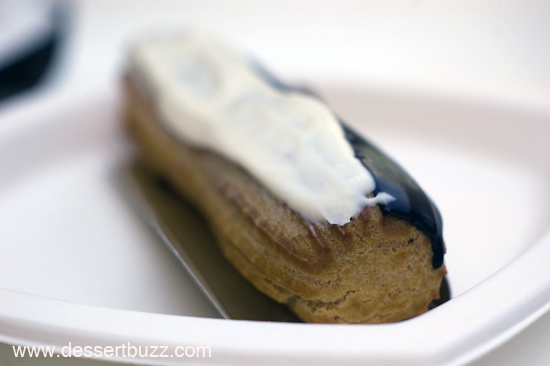 The glaze is half dark chocolate and half white chocolate and one side of the éclair is filled with chocolate cream, the other with vanilla cream. 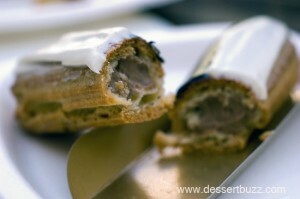 The thing about eclairs is that I suspect most people have never tried a really good one. I have memories of the eclairs they sold at Twin Donut in New York in the early 80’s. This is a place where on any given day there might be three homeless guys sharing a cruller and smoking cigarettes at their table. Why order it? There are only 1 or two other places in NYC to get an eclair this good. Canneles: Without a doubt the best I have tasted in NYC. They feature a dark, crisp and perfectly caramelized exterior and a super-moist interior. The custard-like-inside has plenty of flavor too owing to the liberal use of rum in the recipe. 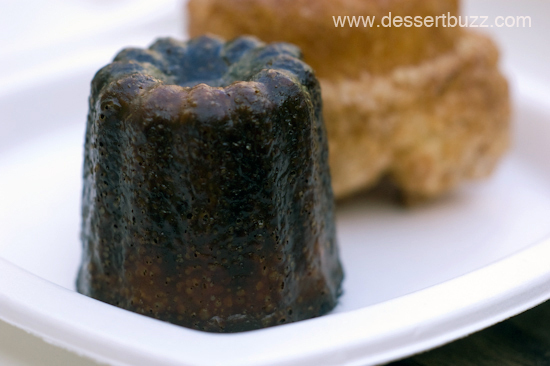 Read more about canneles along with some great photos here. Why order it? Transport yourself to Bordeaux for only $3. Mini-Me Chocolate Cake: With all due respect to Verne Troyer this is the best incarnation of Mini-me. The “Mini Me” meringue-topped chocolate cake is served from a case but it might as well be a made-to-order plated dessert. It has a perfect blend of flourless chocolate cake, chocolate mousse and a dark chocolate glaze. Toasted meringue “mini-me” twists on top (available for purchase separately) finish off the dessert. Despite all the chocolate it’s still not too sweet! Why order it? If you’re a chocolate lover–stop contemplating and get it. Visit us again tomorrow for Part II: Paris-New York, Gâteau Battu, and an interview with the man himself. The City Sweet Tooth » Sweet Links of the Week – 12/9!